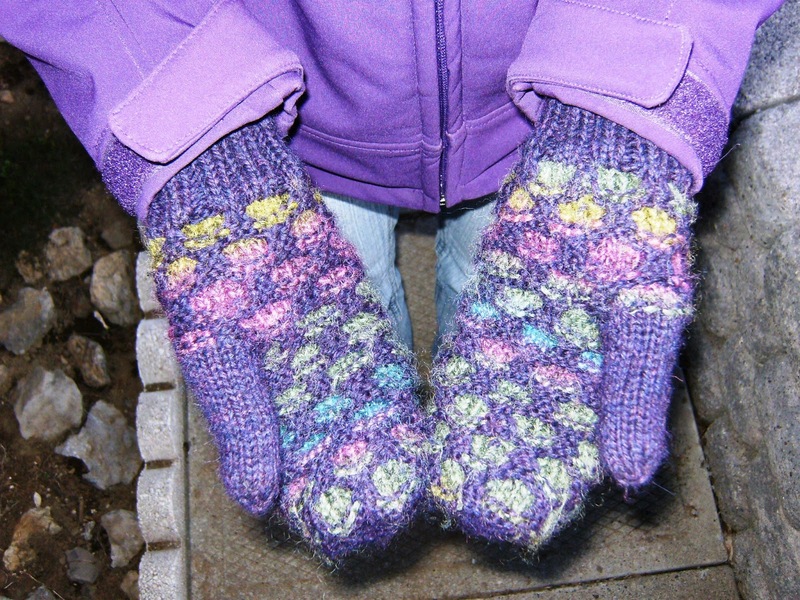 In honour of Finishing Friday, here's a photo of my completed mittens. I finished them just in time to use up North last week where I was visiting family. These mitts were so fun to make, I have plans for at least two more pairs to give as gifts, but I will have to wait to make them. I've officially declared my knitting season is closed. I've the idea that if I focus on fewer projects over large chunks of time, alternating the projects every few months, I may get more done than if I work on many at once! This season there's the garden and preserving, all kinds of outdoor activities and since I've been knitting all winter, my sewing pile could really use some attention (on rainy days!). Oh well, there are worse problems than being enthusiastic about too many things! Nicely done. I second that comment about focusing on a couple things instead of many. Better to be a master of a few things instead of good at many. They are adorable mittens! :D Purple AND rainbow-y. Yaay. Good accomplishment! Good luck with keeping your projects under control. XD I feel like my own always have a tendency to get out of hand too.